My cherie and moi were deep in conversation when the sudden thud of the 747 felt like it came apart topped by oxygen masks dropping and flailing at our faces. Simultaneously, my heart leapt to my throat as the cliche goes only to realize that the aircraft had eventually landed in Johannesburg at 5am and had already gone into taxi mode as the pilot's delayed announcement blamed the scare to very cloudy skies and to the plane's auto-pilot. Welcome to South Africa, circa 2002, a sequel post to the 2010 World Cup. We came to South Africa devoid of expectations and were pleasantly surprised. On transit to Cape Town, we discovered the Joburg airport as quite modern, orderly, and clean. The flights were on time and the models of their national carrier relatively updated. It of course helped that most of those we ran into spoke very good English and all together we got this sense of safety and promise. It was an hour's flight to Cape Town and from the air we sort of envied the vast natural resources available to this nation. In spite of what we knew about blood diamonds, we couldn't help but admire the numerous mine exploration activities that were visible from about 35,000 feet overhead. Cape Town looked even more modern and on the surface wealthier that most places in Africa and while at the airport we felt like arriving in a European city. As all modernized cities, Cape Town was not spared from urban squalor. On our way to the city's center, we witnessed a very long stretch of what seemed like organized shantytowns which according to our driver are the hovels of drug and crime denizens. I said organized because from the highway the frontage shanties looked all the same in size and color but each one seemed too small to live in. If this City were the most visited in the country, it might have been interesting if walking tours were arranged around this place in order to appreciate better the local culture and politics. But one comes to tourist destinations and falls prey to the showcase landmarks. 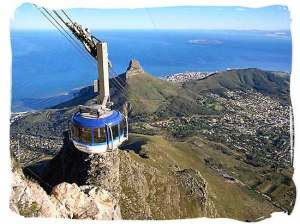 I won't forget ascending Table Mountain, a flat-topped mountain overlooking Cape Town. We were there close to dusk and witnessed how the City sparkled at night. "What luxury, because in my country, we spend nights without any electricity", commented a colleague from Myanmar who marvelled as well at the sight. They said that one could actually walk to the top but we decided to take the short cable car ride which we never regretted. Viewing the scenery below and around the car as it slowly climbed was both a breathtaking and a thrilling experience. We tasted history on Robben island where Nelson Mandela was imprisoned. The island accessible through a fast watercraft is now a tourist spot, looks barren nevertheless, but hosts flora and wild animals unique to Africa. An old prison bus took us to the former prison complex where we were led to Mandela's cell. Just one minute in front of that cell, a colleague wept incessantly and had to be taken away and back to the main island. Later that day, she expressed having been affected by the vision of Mandela's suffering. Incredibly, we agreed that it was this part of the trip that should be the most memorable. Cape Town is a shopping haven, especially for those who come from countries that are devoid of life's luxuries. A friend bought a video game console for her son because there wasn't any demand for these gadgets in her country, Malawi. She found her object at the Victoria and Alfred Waterfront which is really an operating harbor and at the same time a complex of various shopping and entertainment venues, quite unusual in that it is set before the sea and within perfect view of Table Mountain. We brought home some local handicrafts. These and the World Cup were very enticing reasons for us to have gone back this year. The year isn't over yet but the Cup will soon be. 2014 in Rio? They say that not all cities of South Africa are safe to visit. Ma cherie recounts that one morning she came across a dead man who has been shot on the street fronting her apartment -- not quite a welcome event for a newcomer to Durban. They may be quite right but this country brims with promise, enough to convince us to GO back and for you dear reader to GO. Why a white south african? I'm sure there are just as hot (or even hotter) blacks. Hope you get your wish.